Valentine’s Day is right around the corner and we would love to host you and your significant other on Thursday, February 14, 2019! 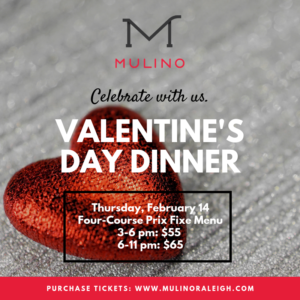 Tickets are available for $55 per guest between 3 and 6 p.m.; $65 for seatings between 6 and 11 p.m.
We are offering a special four-course prix fixe menu that we know you and your loved one will enjoy that also includes two glasses of wine per person. Check out the menu below and make a reservation before it is too late! We look forward to celebrating with you. You can reserve your reservation through Open Table. Select the date, February 14, 2019, and then choose the time. Once you have selected your time you will be able to pay for dinner online.